virtually all types of processes, automation systems, users and business requirements they are designed to tackle any motor-driven application, in any industry, whatever the power range. You can download the full ABB ACS880 Catalogue by clicking here. The ACS880 inverter is a wall-mounted single drive compatible with a wide range of applications in a broad range of industries such as oil and gas, mining, metals, chemicals, cement, power plants, material handling, pulp and paper, sawmills and marine. Download the ABB ACS880 Flyer by clicking here. 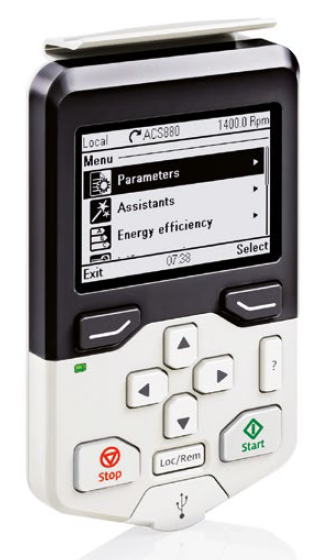 The ABB ACS880 Firmware manual applies to the ACS880 primary control program version 2.2x and the ACS880 SynRM motor control program (option +N7502). The firmware version of the control program is visible in parameter 07.05 Firmware version, or the System info in the main menu on the drive control panel. You can download the ABB ACS880 Firmware Manual by clicking here. The ACS880 Hardware manual is intended for people who plan the installation, install, start-up and as a guide for those who use and service the drive. Read the manual before working on the drive. You are expected to know the fundamentals of electricity, wiring, electrical components and electrical schematic symbols. You can download the ABB ACS880 Hardware Manual by clicking here.